Our business suites are very roomy with a separate bedroom and living room besides a small, convenient, kitchen. Prices are without €0.60 euro residency tax p.p.p.n. An attractive restaurant and cozy hotel bar. Culinary enjoyment in a casual atmosphere. Modern wellness center and fitness. Stylishly relaxing on the 6th floor. 17 meeting rooms with 2 luxury business lounges. The ideal location for your events and conferences. 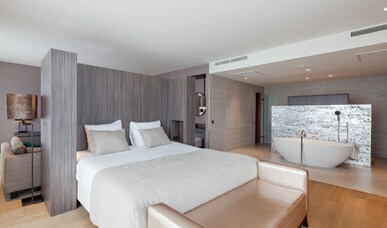 The generous Junior Suites are beautifully situated in the tower of the hotel. The luxurious rooms have a king size bed, spacious sitting area with lounge sofa, double sink, rain shower and a double Jacuzzi. Dream away in the luxurious Wellness Suite with infrared sauna and steam shower! This spacious suite is unique in terms of style and color and leaves nothing to be desired. This suite features an infrared sauna and a steam shower. The spacious suite is unique in terms of style and color. Dream away in real luxury! 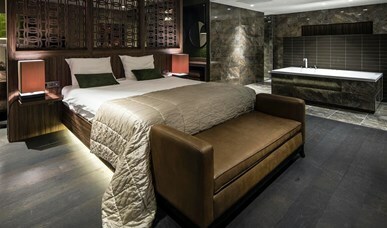 Relax completely in pure luxury! The suite has a double jacuzzi and a wonderful rain shower. The suite is unique in style and color. You will not lack anything here.